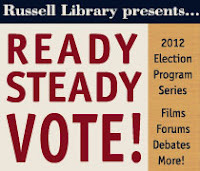 Richard B. Russell Library for Political Research and Studies: Upcoming Events at Russell Library! We are entering the final week of our Ready, Steady, Vote! program series. 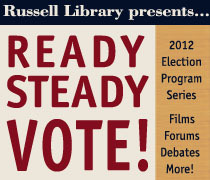 Be sure to join us for these events at the Richard B. Russell Building for Special Collections Libraries. Free event parking is available in the Hull Street Deck. For more information, call (706) 542-5788. Doors will open at 6:30PM for light refreshments. The program will begin at 7:00PM with brief introductions from Dr. Brian Drake, Professor of History at the University of Georgia. Film run time: 110 minutes. Art Opening and Reception, "Doors"
In 2011, the Russell Library commissioned acclaimed painter Art Rosenbaum to create a mural in its new gallery space. The result, titled “Doors", traces Georgia’s modern political history from 1900 through the present and depicts many of the major figures and events that shaped the state. This reception will serve as an opportunity to dedicate the finished mural, with commentary from Art Rosenbaum and Russell Library staff. Members of UGA's Demosthenian Literary Society will re-enact classic campaign speeches in the Russell Library Exhibit Gallery, atop the mighty stump inlaid in the lobby floor.